Try a little something new with your sewing skills. A little quilting, a little sewing, a lot of fun, here’s an easy and completely doable idea that you are going to love having. I could not believe how cute mine turned out! What a great gift idea or something to add to your Etsy shop. 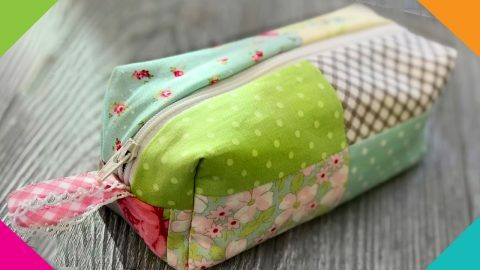 I’ve made zippered pouches before, plenty of them, but never made a quilted one. I guess I could have figured out how to do this on my own, but I never did. This one uses tiny rectangles of fabric, too, so leftover fabric scraps and jelly roll quilt pieces work great. Since you only need 10 pieces, it is simple to match up a set that looks great together. Check out the tutorial video and learn how to make your own quilted zippered pouch. Perfect for carrying makeup in your purse, jewelry when you travel or pens for the inner artist in you, this versatile bag is one everyone could stand to have a few of.